Appreciative Inquiry is a strengths-based approach to creating change. Although it is often discussed in the context organisational change, Appreciative Inquiry can be applied in a range of contexts. The positive core is like the half full glass often referred to in strengths-based practice. It includes strengths, positive experiences, stories, etc. that can be found in all communities, organisations, groups and individuals. The Simultaneity Principle which suggests that inquiry creates change. Inquiry and change are simultaneous events because the questions we ask focus our attention and create new awareness which leads to change: inquiry is an intervention. The moment we begin to inquire into something, change begins to happen. The questions we ask set the stage for what we discover and this information become the stories out of which the future is conceived and constructed. The Poetic Principle which suggests that we can choose what we study. An organisation’s story is constantly being co-authored and by focusing on strengths and what is working, these are what are nurtured. Our choice of what to focus on or to study, helps to create the world as we know it. In choosing the topic we are helping to write the next chapter of the organisation. The Anticipatory Principle which suggests that our image inspires action. Our vision of the future has a major impact on the action we take now. The more positive and hopeful the image of the future, the more positive the present-day action. The Positive Principle which suggests that positive questions lead to positive change. Positive images lead to positive actions. 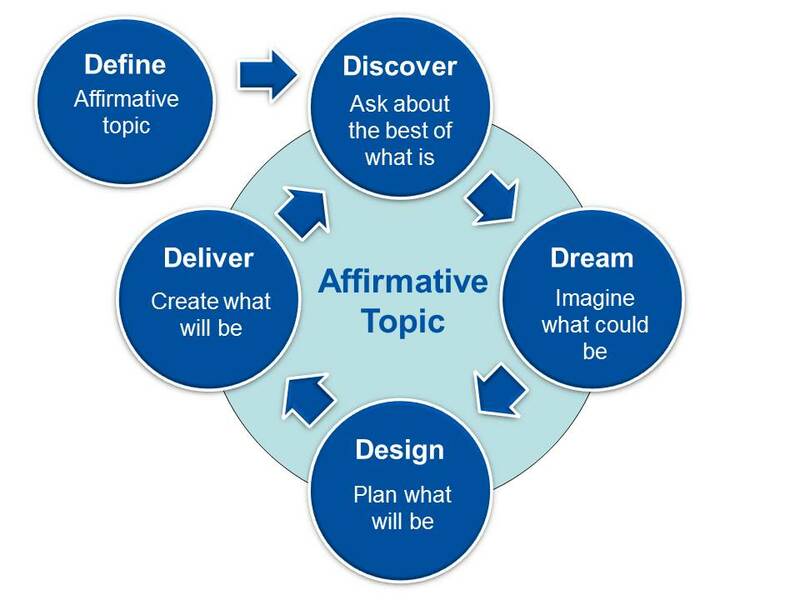 The four (or five) D cycle is a process that is often used in Appreciative Inquiry. By starting with strengths, assets and what is already working it is an example of a strengths-based approach. There are various tools and processes (like the Appreciative Inquiry Summit) that can assist in adopting Appreciative Inquiry. Like many of the processes I discuss in the blog, I encourage you to give it a go and to see what you learn from doing it. Cooperrider, D. L., Whitney, D., & Stavros, J. M. (2008). Appreciative Inquiry Handbook For Leaders of Change (2nd ed.). Brunswick, USA: Crown Custom Publishing. This entry was posted in Working with communities and tagged Appreciative Inquiry, Consultation & planning, Definitions, For students, Strengths perspective, Strengths-based approaches & ABCD, What is, Working with communities. Bookmark the permalink. 3 Responses to What is Appreciative Inquiry? Hi Graeme, I found your site through the zerotohero challenge page and left a comment there. Now that I am here I’m fascinated to see the strengths based model, which I am familiar with in the context of Care and Protection, being applied to community engagement. And I think of course, why not! Thanks for a concise summary of the core principles. Thanks Jill. I actually went to the zerotohero challenge by mistake – I received a notice and thought it was for Blogging 201. I’m glad I did though it was good to hear of some other blogs. I did wonder about that – your blog seems much further along than most of those doing zerotohero.